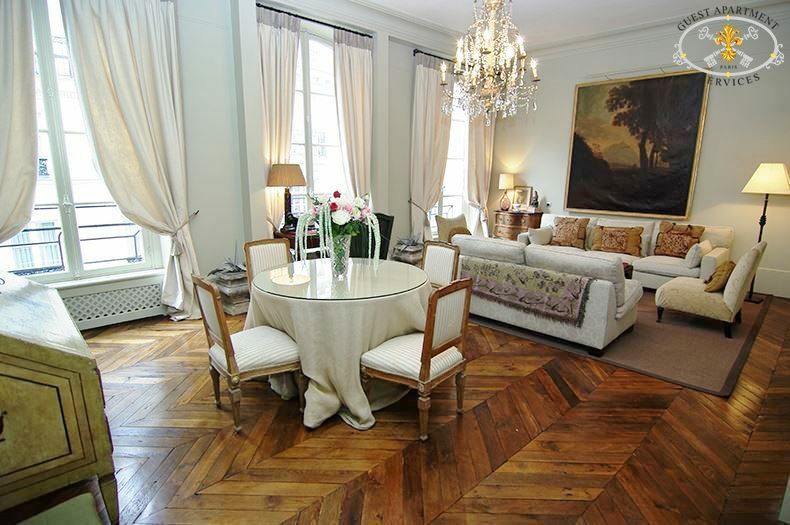 Luxury large property with built in AC system, in the heart of the prime Marais area. 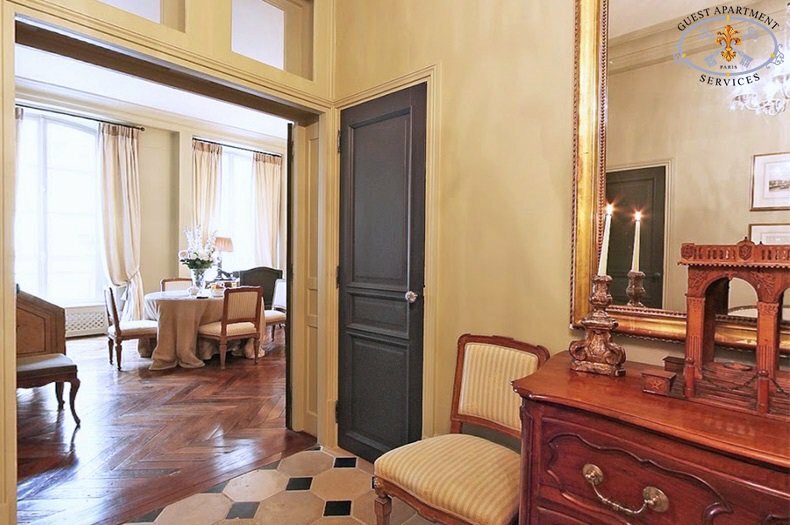 This spacious Paris vacation rental apartment is located in the heart of Le Marais, a Magical area of narrow streets, cobblestone passageways, dotted with grandiose mansions: hotels particuliers. Le Marais is located on the Right Bank; directly North of the Ile Saint Louis, which was a swamp until the 13th century. Monks used it for market gardening, but by the late 15th century nobility was firmly implanted. In the 16th century, the financial and intellectual bourgeoisie began to move into this area. In the early 17th century, Henry IV built Place des Vosges, (a 5 minute-walking from the apartment), turning the area into Paris' most fashionable residential district for aristocrats and royalty until it was abandoned by the aristocracy when the Royal Court moved to Versailles. 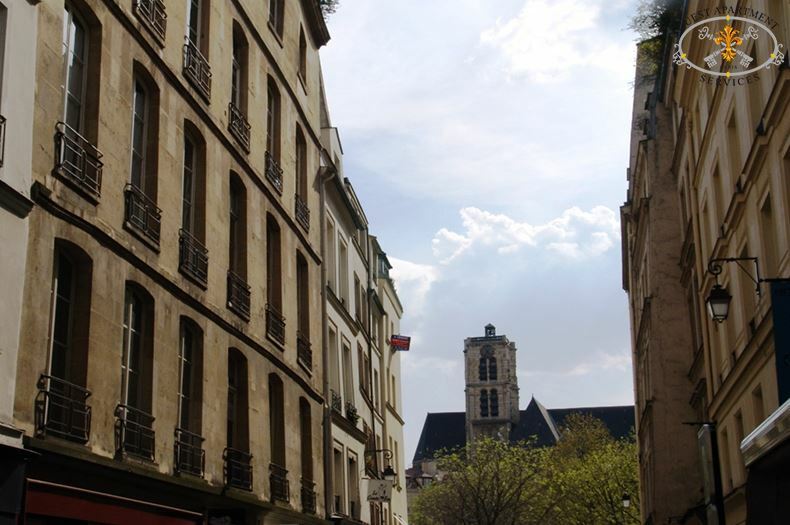 It became rundown during the Industrial Revolution until the very clever, insightful Minister of Culture, André Malraux, in the 1960's declared Le Marais a Historical area. 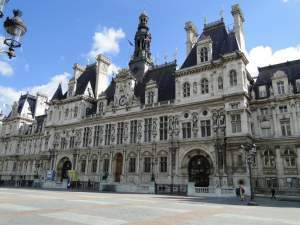 The restoration began in its fullest, preserving its beautiful 17th century architecture, its magnificent mansions, which have been turned into museums (Carnavalet), and public offices. Le Marais is fashionable and fun with its upbeat boutiques, stylish cafes, and great restaurants and of course a fabulous place to rest in the garden near the fountains of Place des Vosges. 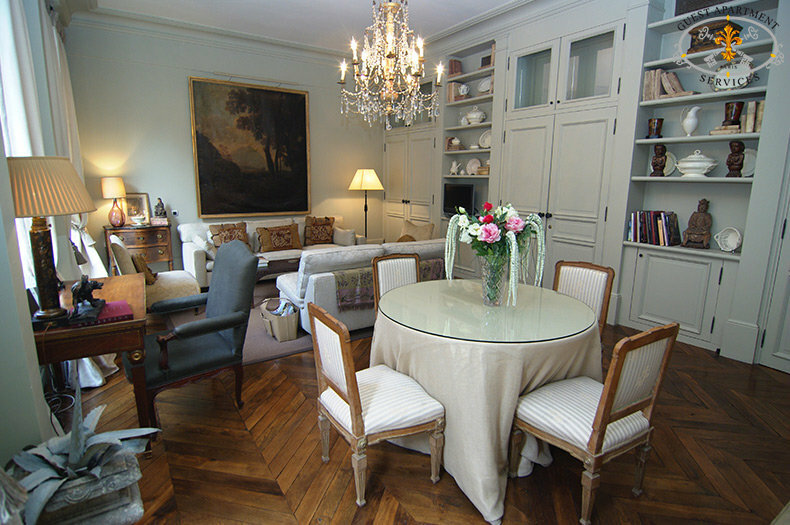 This Paris holiday apartment is located in a quiet street. 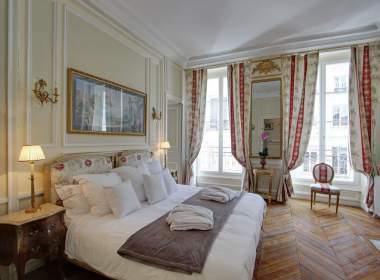 Located in a 17th century building overlooking other gorgeous buildings. 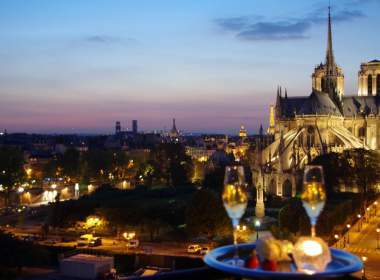 You will notice straight away cafes, boulangeries (fine bakeries) Band restaurants nearby. Upon arriving, you enter through the heavy wooden door, used originally to allow a horse and carriage to enter. You then reach your 3rd floor apartment by its charming lift from the 1930s. 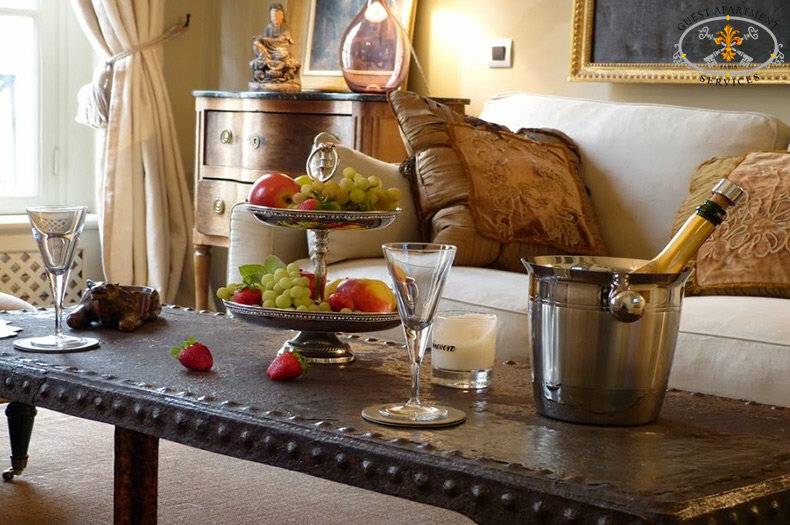 The proprietor, an antique dealer, has not only recently renovated this magnificent apartment totally, but has also personally carefully picked all the furniture and charming details, blending the contemporary and antique influences forming a harmonious setting for your visit. 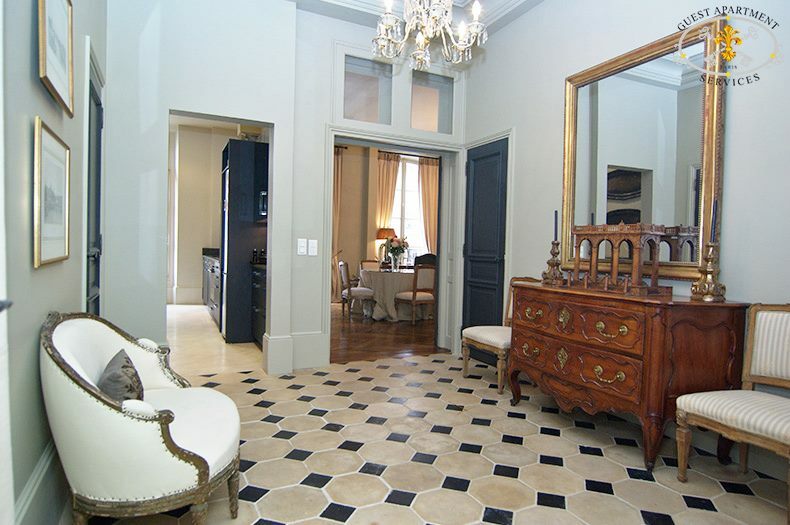 Being in the hustle and bustle of Marais, this vacation rental apartment nevertheless offers calm and serenity in the backdrop of sand, beige, cream and dark brown tones. 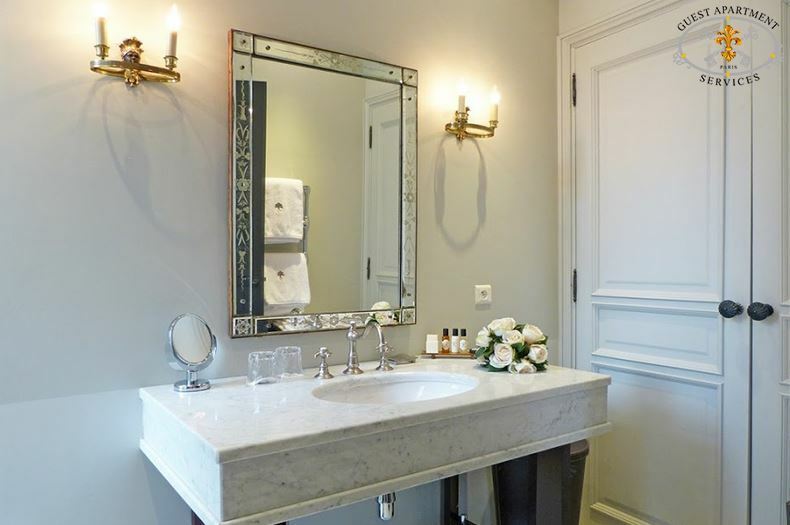 The foyer is spacious, laid out with sand and black coloured stone tiles, and welcoming you with its 18th century commode, adjacent mirror and decorative canapé. From here, you have access to the living room, the master as well as the guest bedroom, each with adjoining marble bathrooms, the kitchen, the guest toilet, and two storage spaces. 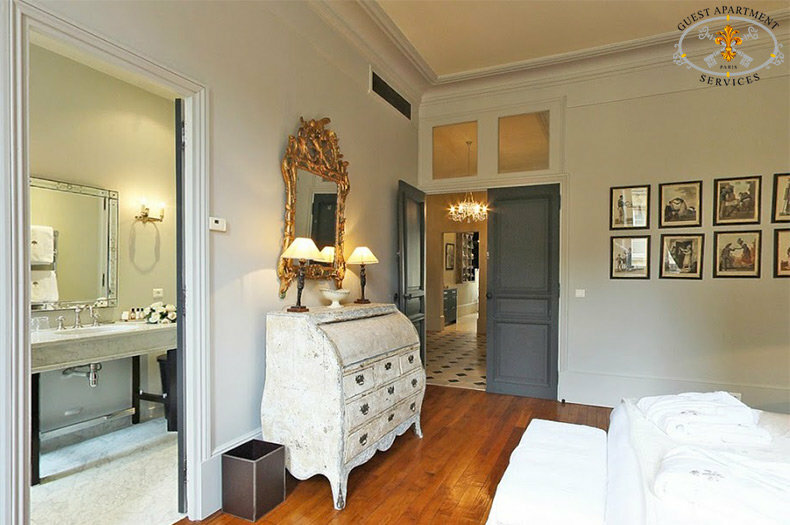 Going through the French doors, you enter into the spacious and airy living and dining room, naturally lit by three large windows adorned with silk curtains, overlooking the street below. The entire floor is made entirely of dark herringbone parquet floors, the ceilings are high, and a built-in wooden cupboard, contains the flat screen TV. Throughout this room, tasteful furniture and unique decorations are in abundance, such as the beautiful chandelier, and the collection of sculptures and white china. 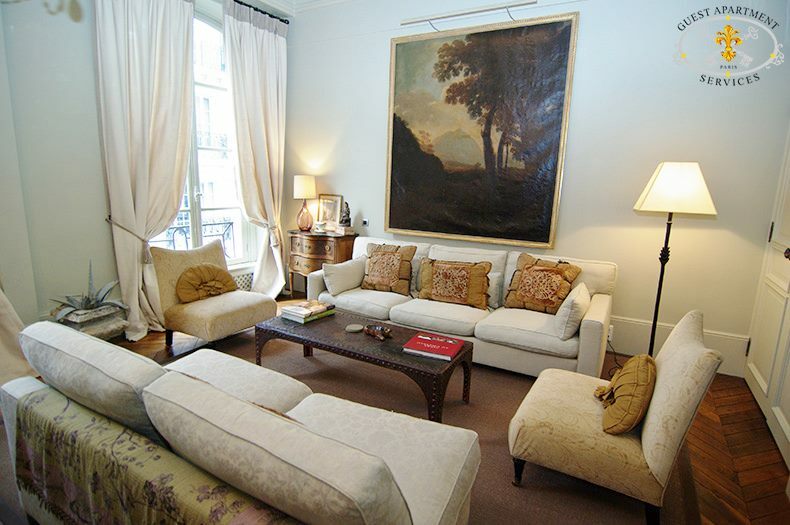 The impressive 18th century landscape painting, around which you find a two comfortable sofas and armchairs with a unique bronze metal sofa table, dominates the living room. 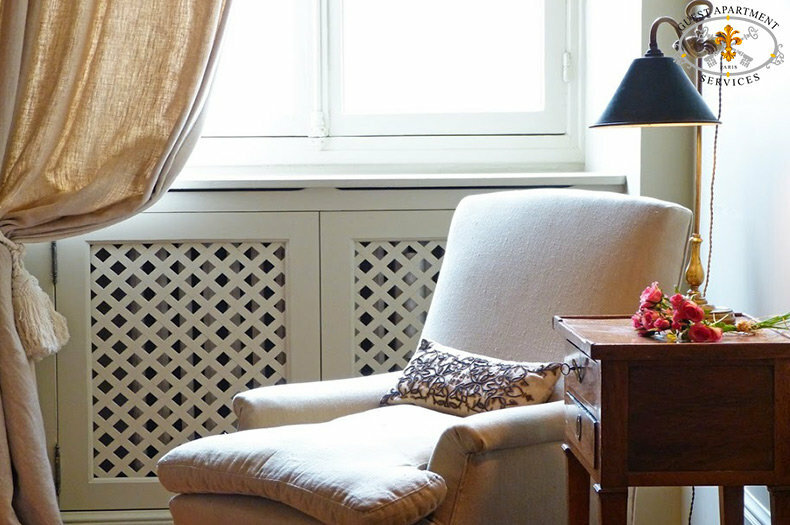 The antique desk with a view onto the street provides a perfect spot for you to write post cards sharing your Parisian adventure with your family and friends. The dining area is ideal for enjoying either a candlelit dinner for two or hosting a dinner for a selected few, with the antique dining table seating four comfortably. Next to the table, you find the Venetian mirror and secretaire – with the mirror beautifully reflecting both the sunlight and the light of the chandelier. 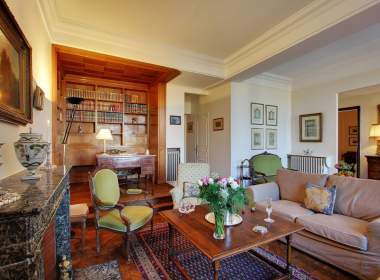 The true comfort of this luxurious apartment is the two separate bedrooms, both generous in size and facing the courtyard, thus providing real privacy and calm. 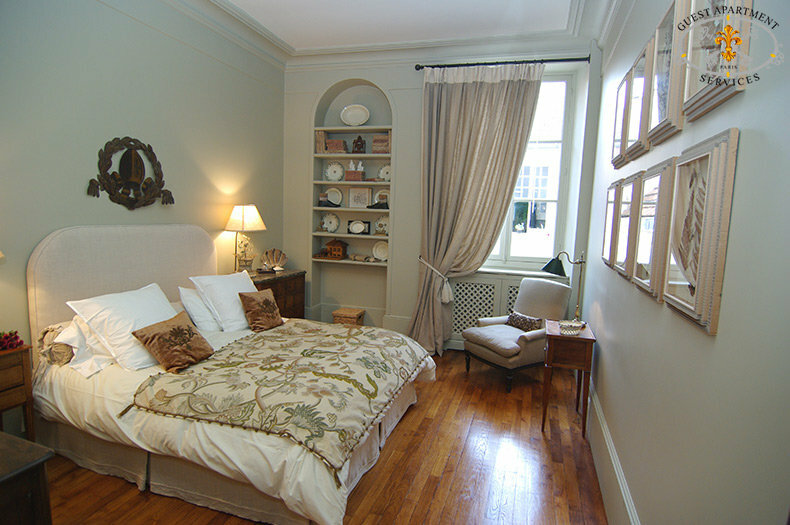 In both rooms, the walls are painted in pale beige and cream tones, off-setting the dark wooden parquet floors, and with elegant silk curtains that adorn the large windows. 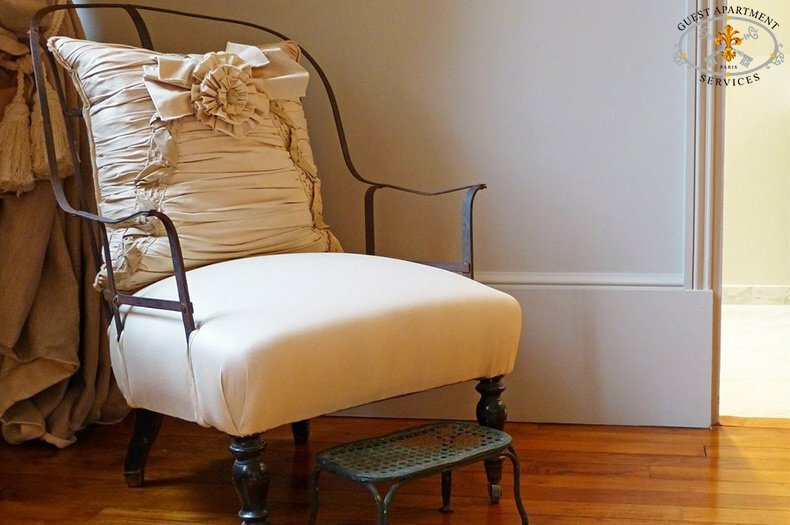 The first master bedroom, accessible through the entrée foyer, is kept in cream tones, and filled with antiques and quirky details, such as the armchair with a bronze finishes and matching foot rest and a collection of 18th century prints. 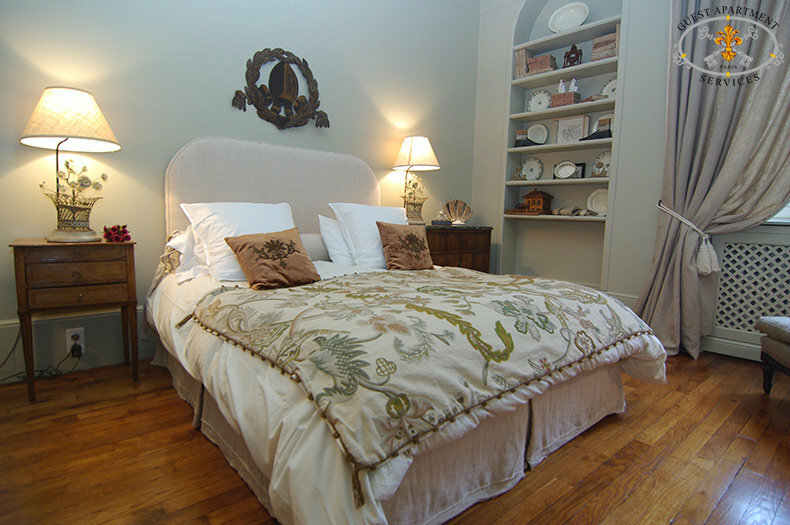 For your comfort, we have installed a Queen sized bed, with a bedside table on one side and a small desk drawer on the other, both with a bronze reading lamp and decorations. Opposite the bed, an exquisite 18th century desk drawer, still covered in its original paint, with a mirror on top, decorate the space. The en-suite bathroom, featuring Carara marble floors and sink, boasts a very big shower adorned by mosaic and marble patterns sand, beige and cream tones. 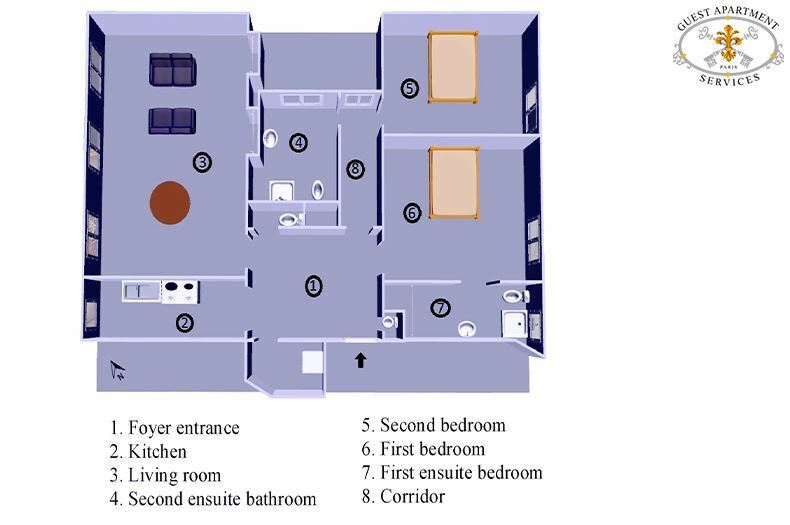 In addition, it is fitted with all modern fixtures facilities (such as a towel heater), a toilet, and in the back, you will find a roomy built-in closet. Light streams through the small non-see through window overlooking the courtyard as well as built-in halogen lights in the ceiling. Hairdryer is available. 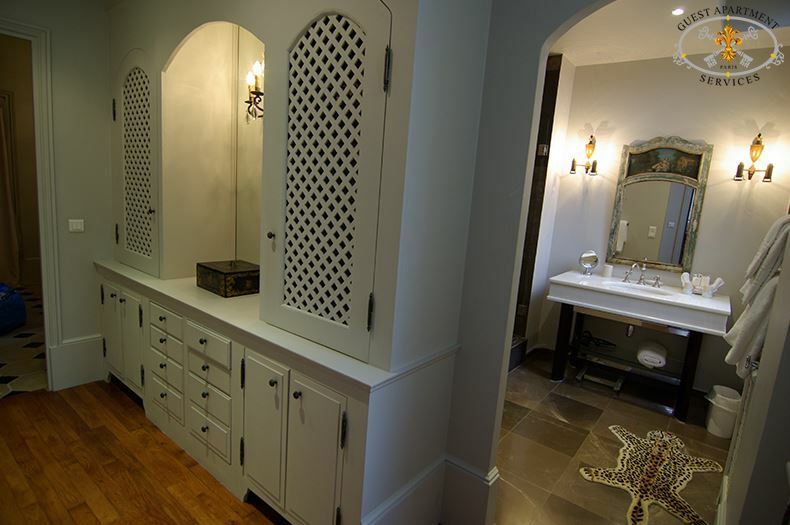 Also accessible from the foyer entrée is the dressing area leading to the second master bedroom and adjoining bathroom. The dressing area contains a huge wooden built-in closet and cupboard which will easily fit all your holiday clothes and personal items. Right opposite you find the bathroom, which too has a floor and a big sink made of Chara marble. 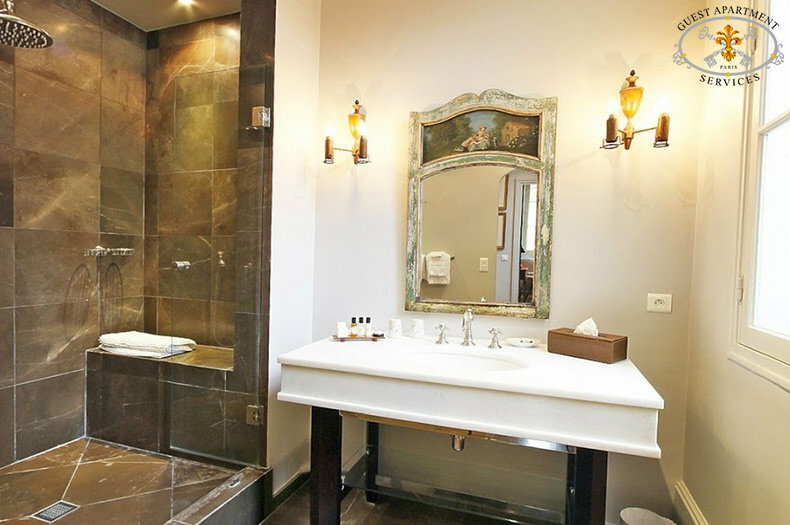 This spacious bathroom features also boasts a large shower, towels dryers, halogen lighting, wide mirrors, several toiletries cabinets, and toilet. Hairdryer is available. 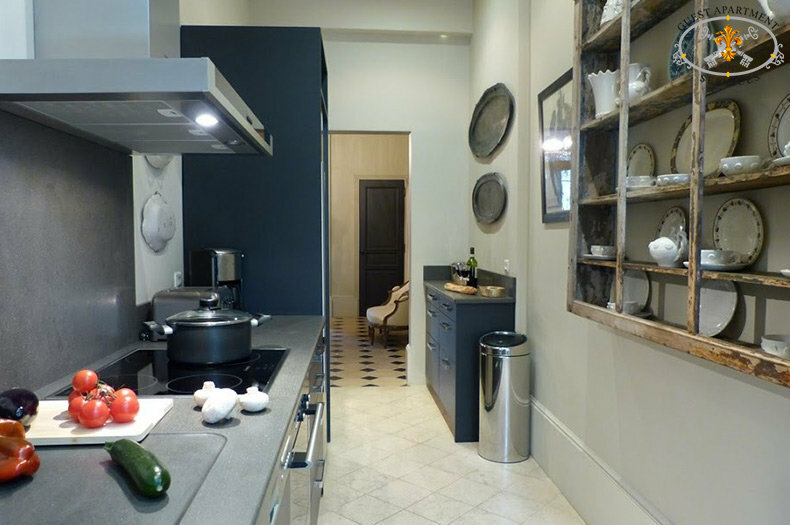 Now returning through the dressing area and crossing the foyer entrée, you enter the kitchen… This kitchen, contemporary in style, long, rectangular and bright, overlooks a typical Marais street, with its small delicatessen and bars, yet being on the third floor still ensure calm. The sand coloured stone floor contrasts finely with the cupboards in mat and lacquered black finish and the granite working spaces. It is fitted with all modern amenities, and all glassware, dishes, cutlery and utensils are provided as is the electrical unit with burners, oven, microwave, fridge and freezer, coffeemaker, electrical kettle and toaster. Moreover, there is a dishwasher and, in the adjoining storage room, you also find a separate washing machine and dryer, an iron and iron board. 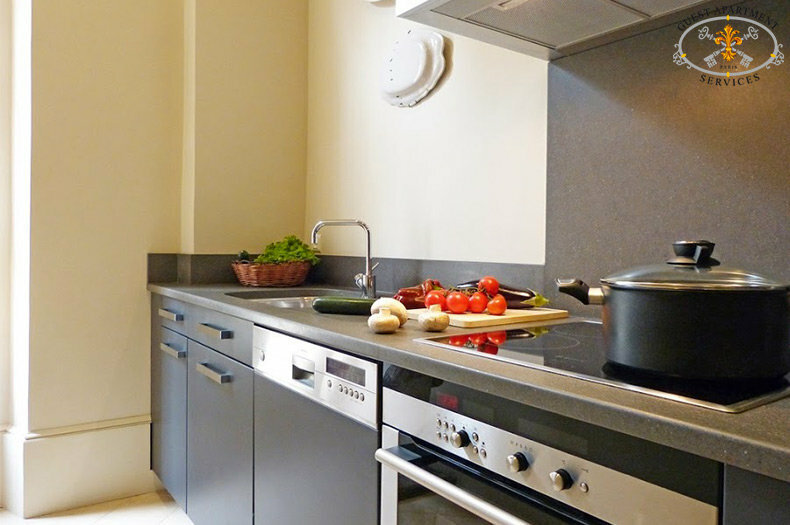 Complementary appliances for this apartment in Paris: telephone with private line and answering machine available in most rooms. 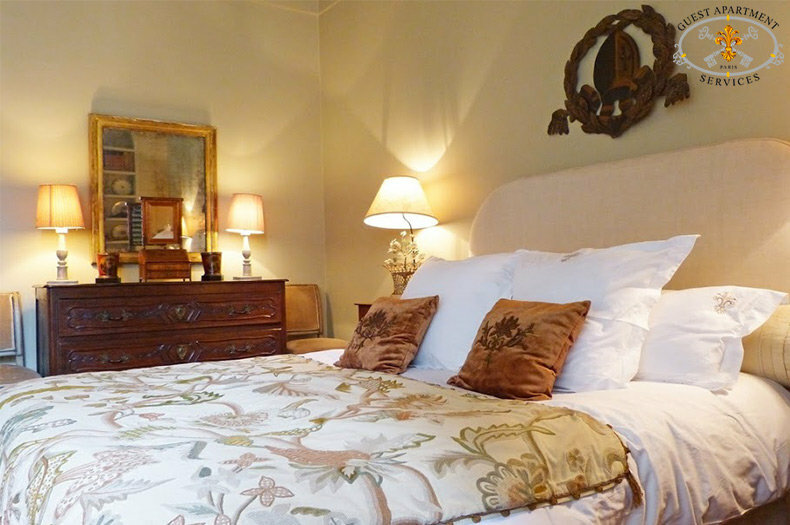 ​This property has the added benefit of free unlimited WiFi access. An English speaking member of our staff will greet you in our office, upon your arrival, during the week days from 10.30am until 6.30pm. 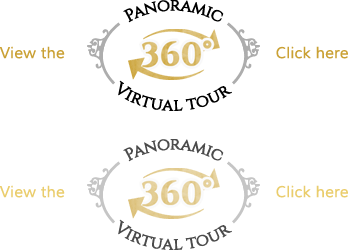 A personalized concierge service to book in advance the best restaurants with specific privileged contacts, Opera and classical concert Tickets with secured reservations (only fort excellent top category seats), cabaret, theatre and exhibition tickets. A comprehensive service is maintained throughout your stay. A personalized airport transfer may be organized for your arrival and departure. Check in time: 2pm; Check out time: 11am. 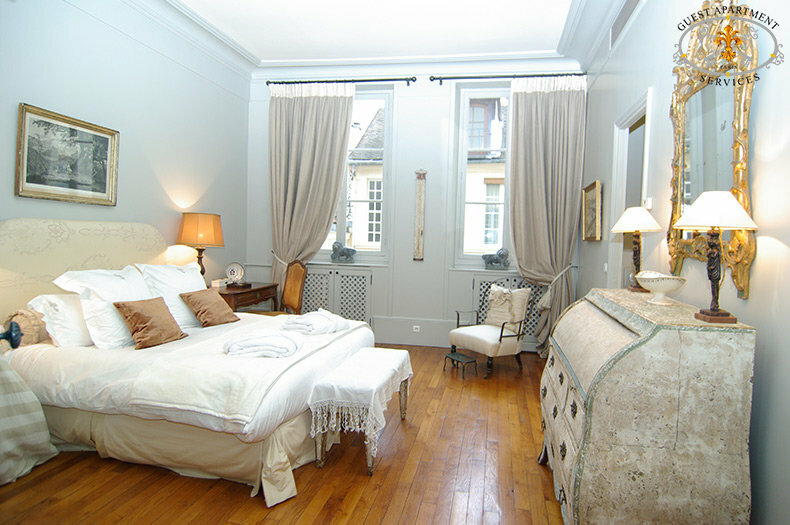 Bed linen, towels, welcome products designed by Guest Apartment Services Paris upon your arrival. 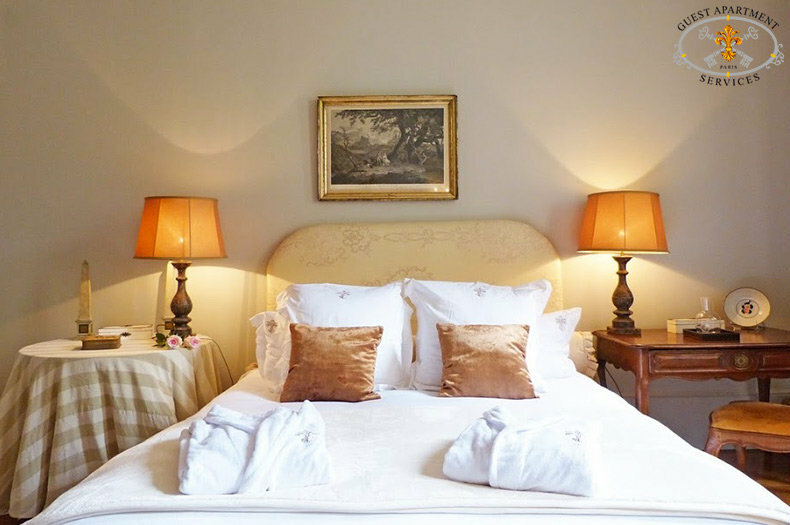 Bed linen and towels are changed as stated in the rental terms. 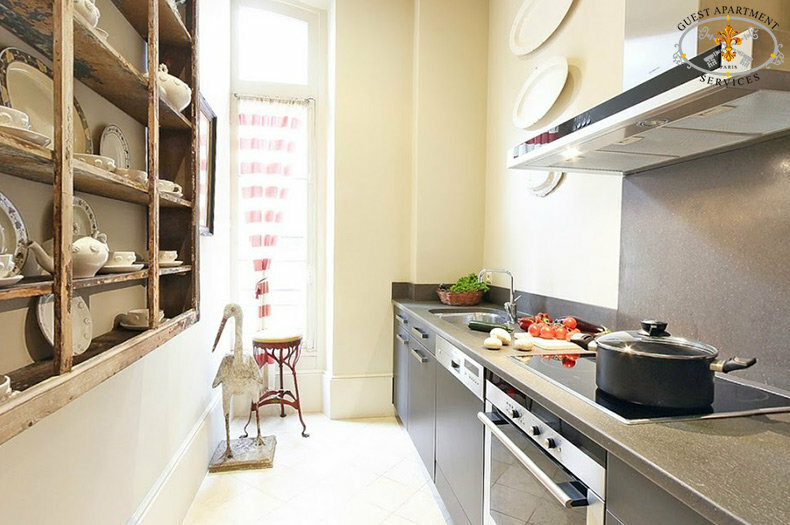 Dishes, glassware, cutlery and all kitchen essentials are provided. We sincerely invite you to visit the informative section "SERVICES & AMENITIES" on our website to discover all the services at your disposal for a quality stay. 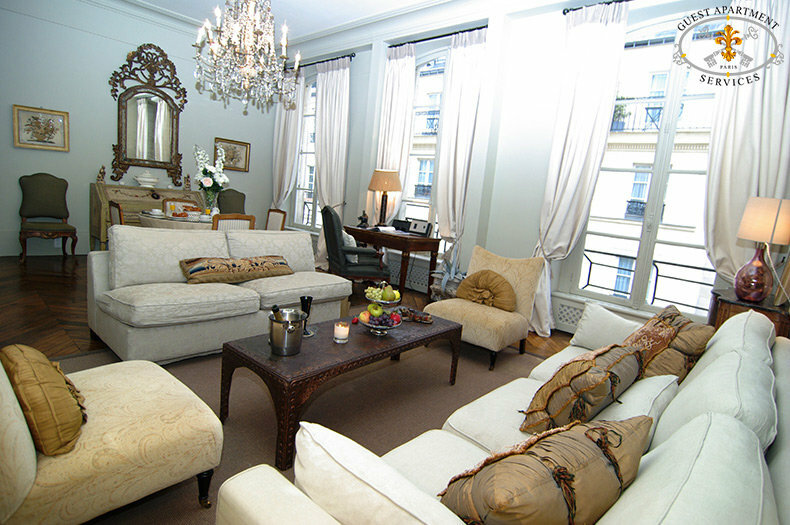 Guest Apartment Services Paris, 17 rue Saint Louis en l'Ile, Ile Saint Louis, 75004 Paris, France. 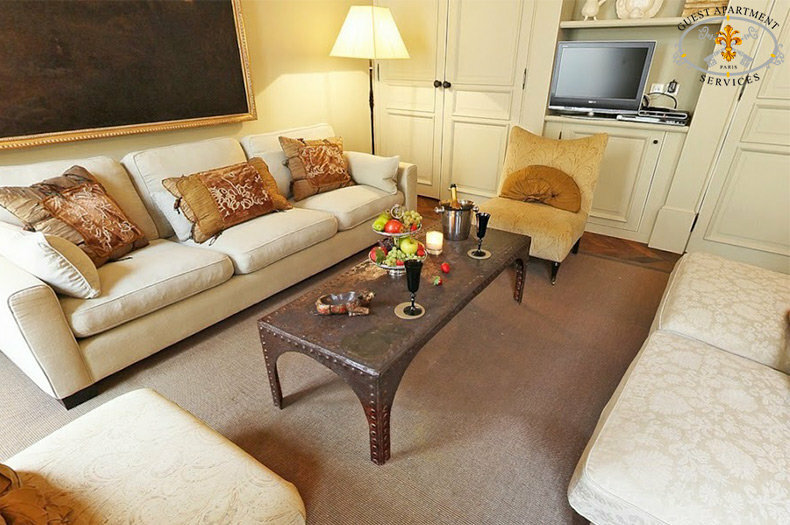 Guest Apartment Services Paris is rated 4.9/5 according to 51 reviews on facebook.